Best Magazine – I’ll have to disagree with the title of this theme. It isn’t SO bad but the black and yellow rollovers just destroy this theme for me. Quoting – I like the concept but the text is unreadable and I am not fond of brown that is the same color as baby poo. (I’m looking at you Zune). 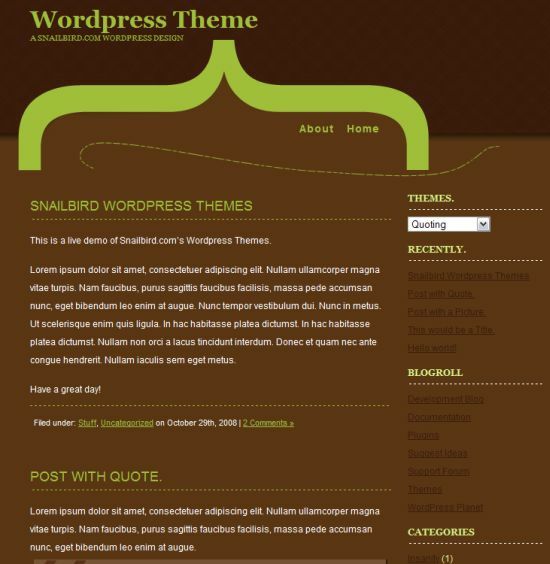 WordPress Theme Well, beyond having an original title I just don’t get this theme. It isn’t exactly ugly but I don’t know what they are going for here – travel, postage, corn oil? 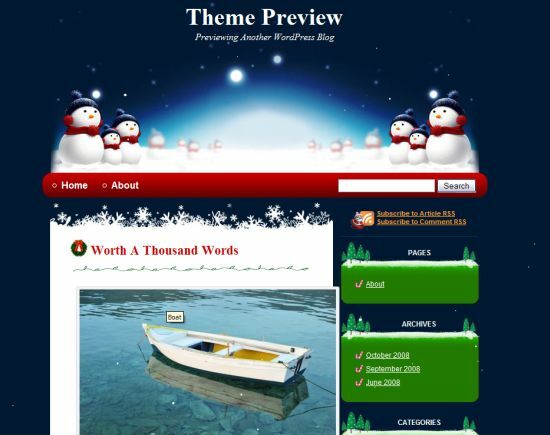 WP-Christmas – I guess I’ve been collecting some of these links since the holidays. I’m not sure how orange is a christmas-y color and that Santa is way too creepy. 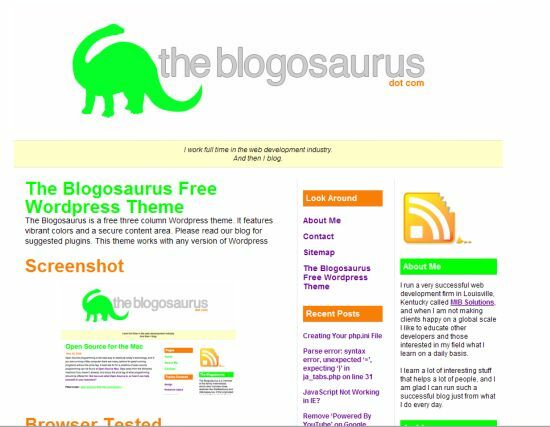 The Blogasaurus – This theme says it features vibrant colors. I would have to agree with that statement. The Cloud – I don’t know … the blues just really bother me. I might just thing the colors are ugly rather than the actual theme. Exchange District – Wow! This is *really* red. It’s listed under Real Estate themes – I guess it would work if you’re selling to vampires or citizens from the village of the dammed. That’s unfair, Kim. You’re not reviewing the themes but how they look at default. Any theme can be tinkered with, as you know. That brown can easily become white, for instance. Ari Herzog´s last blog post – Is Direct Marketing a Dying Breed? Hi Ari – I am definitely judging a book by it’s cover in this instance. I have not installed or tested the functionality of any of them. The second one is gross :) A couple of others are not really ugly though they are cluttered or use full page background images. Why don’t you post more beautiful themes :P I am still in search, thanks for the arthemia recommendation. 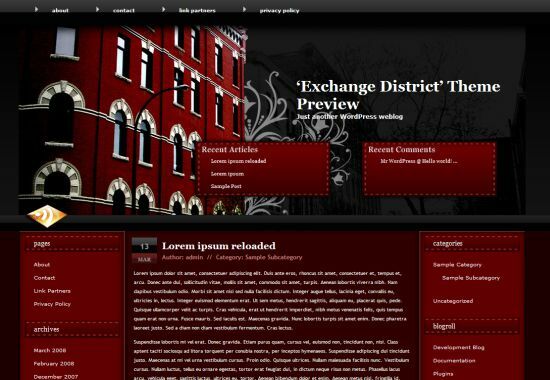 Right now, I am also taking a look at the new wpthemedesigner themes. Ajith Edassery´s last blog post – Blog Scraping – How to deal with it? Hi Ajith – I don’t encounter as many beautiful ones. I do have you in the back of my mind but have not come across ones that meet your criteria. I do think you did yourself a disservice by having the ugly dog as your picture. The ugly themes can only look better by comparison. Hi Jim – Zune poo – LOL I had to refrain myself from sending you that dog picture yesterday. 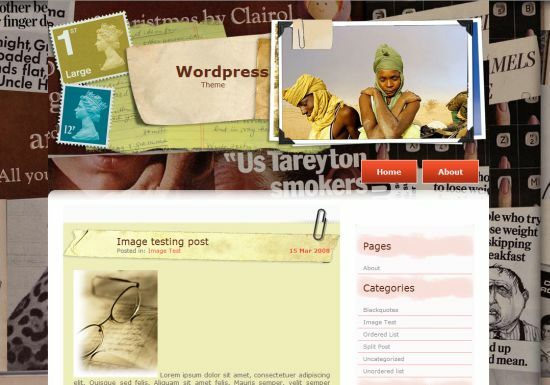 Hi Stratos – I don’t think you have bad taste – you picked a wonderful theme for your site. Are most people going to edit the CSS or know how? HA, not only was this awesome, but I got to see the dog again. My morning’s off to a pretty rad start. Thanks. 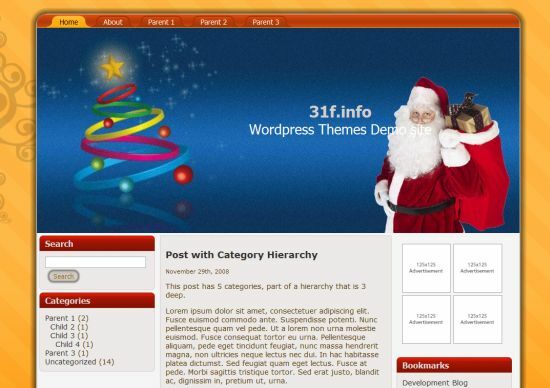 WP-Christmas and The Cloud are clearly Artisteer themes. I think that as that tool becomes more popular we are going to see a flood of amazingly ugly themes. 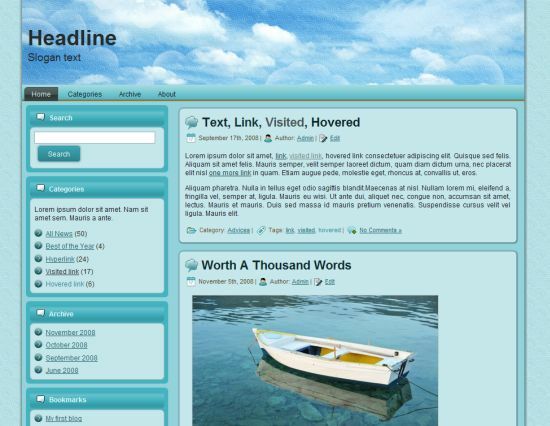 It used to take skill to design and code even the ugliest theme. Now with Artisteer, any idiot can churn them out by the dozens. I am surprised we are not seeing themes that look like Elvis painted on black velvet or knitted toilet paper holders. Actually, Artisteer themes are so ugly that I think they should be in a category by themselves. It’s not fair to include them with the other ugly themes. 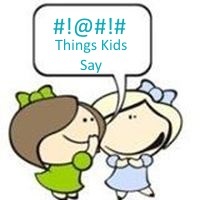 Margaret Flanigan´s last blog post – Why didn’t I approve your comment? How do you know? Have you worked with Artisteer? 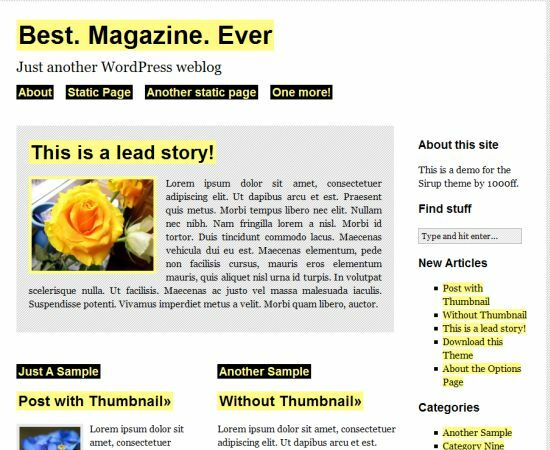 I only came across it recently and was annoyed that it made theme development seem as simple as clicking some buttons. I didn’t try it. Wow, the The Blogasaurus is very, um, UNIQUE. Hi Vered – It know I’m getting old but it hurts my eyes. Exchange is probably personal – I just don’t like the color red. You know, I knew they’d be ugly and I guess you’d have a picture of that dang dog in the post somewhere, yet I clicked over anyway. I don’t get that about myself. This post was really funny and why did that dog look familiar? 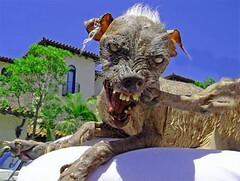 Hi Manshu – He might be a famous for being so ugly. I sent a link to the photo through twitter too. Hi Carla – I can’t imagine changing my theme just for a holiday. Dammit, now I’ll have to stop working on blogosaurus. :) But in all seriousness, that photo of the dog scares me. Hi Kristi – The dog is scary – I also feel really sorry for him. Hey, my dog looks like that and he is crushed now. I told him not to talk it personal, it’s just Kim doing her blogging duty. Jannie Funster´s last blog post – The CDs Have Landed! Hi Kurt – I hadn’t thought about a pagan site … and you’re right – that theme doesn’t make me think of Christmas at all. Hi Gennaro – I really don’t know what they are going with on that one. There’s nothing really wrong with the various pieces but it doesn’t work well as a whole. I modified it of course, with my own graphics, and I figure that seeing as I got it with my hosting package, there’s no reason they should get free advertising ;-) Unless they make me an offer, of course.